Click the image to visit our Facebook page! As you are probably well aware, October is Breast Cancer Awareness Month. Breast cancer is the second most common cancer among women in the United States, affecting 1 in 8 women (just under 12%). Breast cancer is one of the leading causes of cancer death among women, behind only lung cancer. In fact, a life is lost to the disease approximately every 14 minutes. By the end of 2013, it is estimated that there will be 232,340 new cases of invasive breast cancer, 64,640 new cases of in situ (CIS) breast cancer, and 39,620 breast cancer deaths. CIS is non-invasive and is the earliest form of breast cancer. Just under 30% of cancers in women are breast cancers. With such a devastating disease, a disease that touches the lives of so many people, why do we confine our support to the month of October? Breast cancer awareness should be a never-ending endeavor. 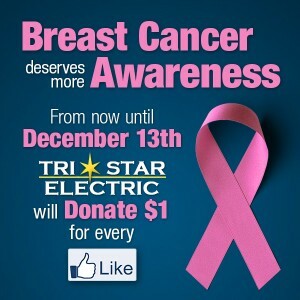 For every new like TriStar Electric’s Facebook page receives from now until December 13th we will donate $1 to breast cancer awareness. Help us make a difference and like our page. Every like…every dollar makes a difference. Currently, there are around 3,000,000 breast cancers survivors in the United States alone. This number is so large in no small part to the efforts of breast cancer awareness organizations, like Susan G. Komen or the National Breast Cancer Foundation, and caring individuals like you. It only takes a few seconds to click the link and like our page. Please take the time and help us make a difference! This entry was posted on Monday, October 14th, 2013 at 3:16 pm. Both comments and pings are currently closed.